Happy Sunday! Are you in the mood for love? In need of a romantic pink bedroom suite? Can’t get enough hearts & flowers? Or, maybe just love Valentine’s Day (like I do). Today’s post features CIRCA Livings Love Notes Room Collection in Amaranth discounted 50% off at Color Me Project till Wednesday, February 3rd, so run now. The lovely and romantic Valentine themed room is available in either deep ruby or amaranth (rose-pink) hue, both colors are 50% off and all pieces are sold separately. The Love Notes series is a mix of vintage with modern touches including desk set with opening drawers and 24 male/female chair sit animations, V-day card string, letter ladder with rose planter, vintage birdcage, wall and side tables, multi frame heart wall art, and damask area rug & drapes. I paired the Love Notes items with Sway’s Rosalie Romantic Bedroom previously released at Uber, now available at the main store. The bed is available in PG or Adult version with 20 single/friend animations for up to 3 avatars or 10 couple poses. There are 8 linen texture options and 3 metal frame finishes (gold, silver & copper). The Rosalie set includes a bedside table, lamp and decorative accessories. Also shown above are Sway’s Keira Candlesticks & Picture Frames offered in 6 color choices. In addition, I used Sway’s Birdcage Wall Art & Candle Holders available at Tres Chic until February 10th. Lastly, I accessorized with La Galleria Valentine freebies including the rustic wooden heart collage, applique wall hanging, pink heart garland, needlepoint Valentine toss pillows and heart trinket boxes. On the desk I added Lunar Seasonal Designs color change Vase of Heart Flowers available at Perfect Ten for 50% off. Hope you enjoyed my love is in the air Valentine themed bedroom and don’t forget to take advantage of the deals, some ending soon! Interior & Spaces Styles BOSL! 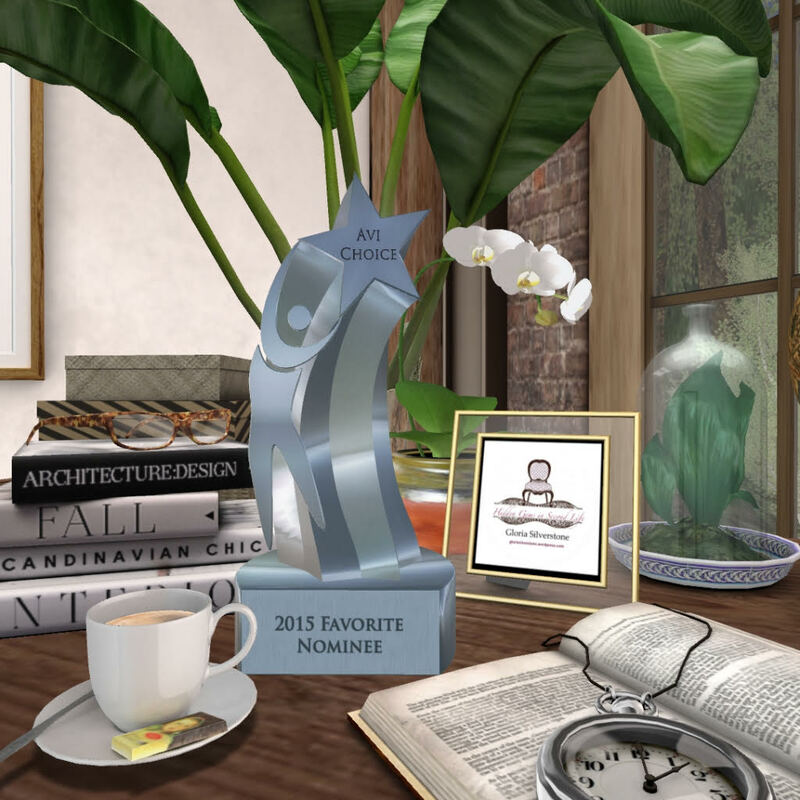 Greetings fellow interior designers, Second Life residents and friends! Hope everyone is having a wonderful holiday season. Big congrats to Hidden Gems for its’ 3rd year anniversary. I’ve been bursting at the seems to share some exciting news with you, my interior design company, Interior & Spaces Home Designs, was hired to design four areas on The Best of SL sim for the BOSL’s Holiday Lyric Hunt (December 13th-31st). BOSL is the premier fashion agency, magazine and shopping district as well as the organizers of the Miss Virtual World Academy, MVW and Mr. Virtual World Pageant. I’m truly honored to have the opportunity to expand my business from residential home consultation to sim builds for fashion agencies. The Holiday Lyric Hunt is taking place in four sectors of the shopping district offering male/female/unisex and home decor gifts. I designed four theme scenes: traditional Christmas (section #1), silly snowmen (section #2), winter landscape (section #3) and modern holiday glam (section #4) using products from Sway’s, What Next, Finishing Touches, Park Place Home Decor, Dreamscapes Art Gallery, The Mustard Seed, Potomac Signature Homes, Chez Moi, Vespertine, The Loft, Convair, Baclava, Trompe Loeil and Silvery K. Please stop by the different locations to check them out and feel free to contact me for exact product information or design consultation at gloriasilverstonesl@gmail.com. Happy Holidays, Merry Christmas and Happy New Year!